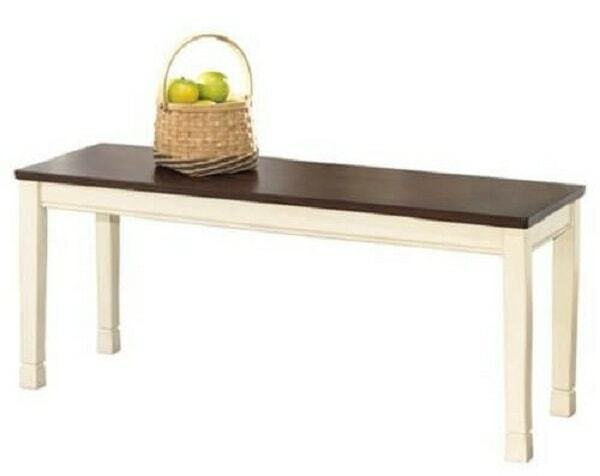 The farmhouse decoration becomes more popular from time to time. Many homeowners choose this style of layout to style up their beloved rooms nowadays. The farmhouse living room, kitchen, and bathroom are one of the latest thing that you will easily find in lots of home improvement inspirations. It’s all over the internet and magazine which perhaps make you feel a little bit tempted to try. Yeap, choosing the farmhouse style decoration is never a bad idea since it’s kind of timeless theme to decorate your house. It’s also such a timeless style that will never look outdated from time to time. 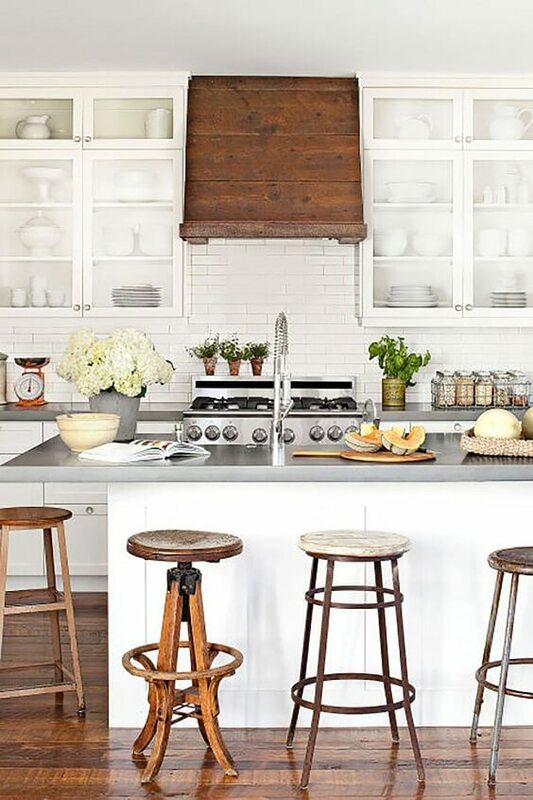 Here, we have picked some inspiring beautiful farmhouse kitchen ideas which also look so unique at the same time. You can make them as the references when you are about to remodel your existing kitchen into a farmhouse one. 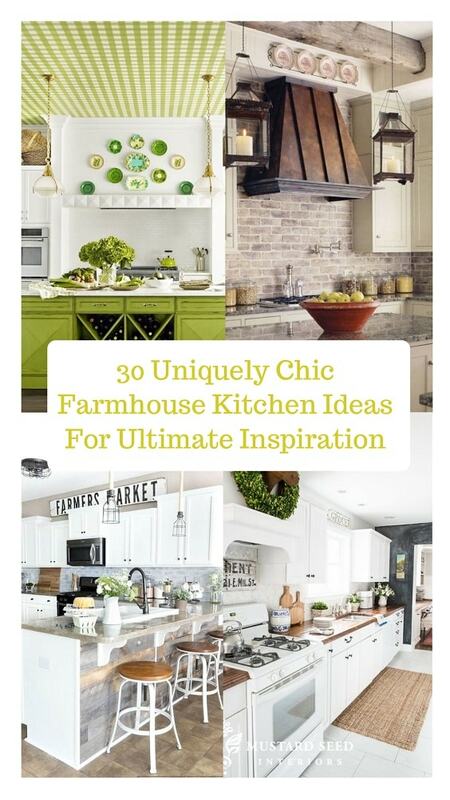 Well, let’s just keep scrolling to check out our best pick of farmhouse kitchen ideas! 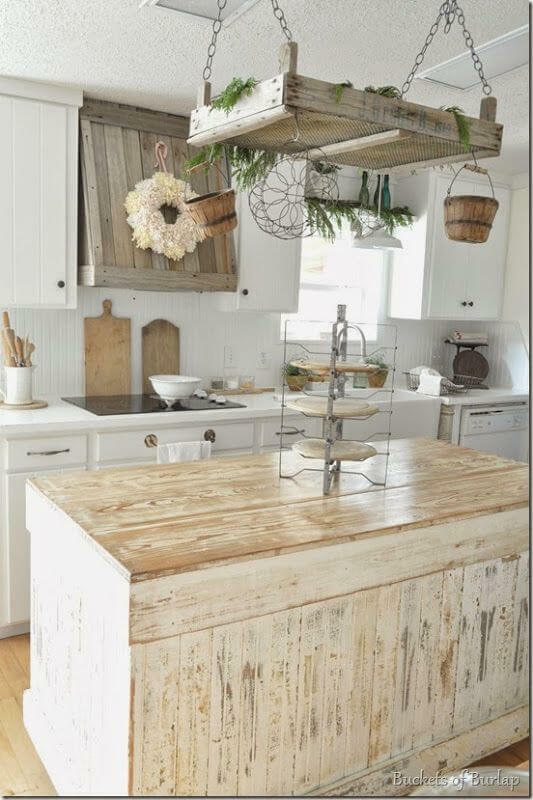 The distressed kitchen island of this farmhouse kitchen ideas gives a nice rustic touch beautifully which complements all of the wooden elements around. Then, some greeneries are placed on the hanging storage above the island to give a unique nuance. To create a decorative look, this farmhouse kitchen ideas use some wooden hanging shelves to display the dishes stylishly. The area becomes such a catchy focal point which looks so standout among the white walls. Combining the modern style with farmhouse touch has become one of the most favorite layouts today. 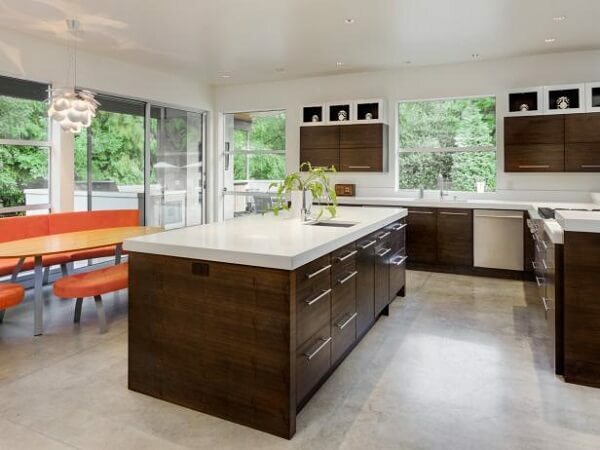 Here, some wooden accent is added gorgeously to a kitchen which is full of steel and white kitchen appliances. 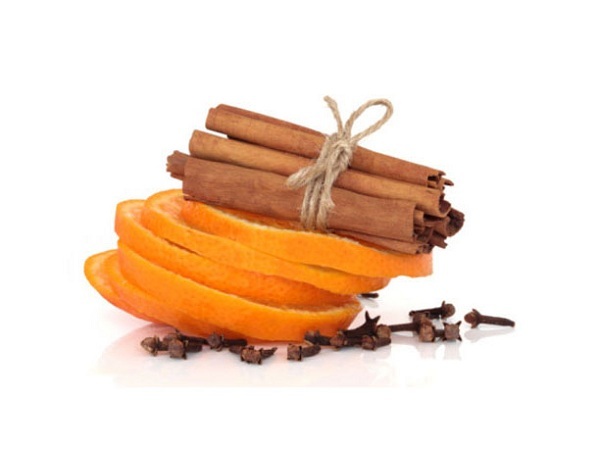 Besides wood, copper is also another nice earthy element that you can add to a farmhouse kitchen. 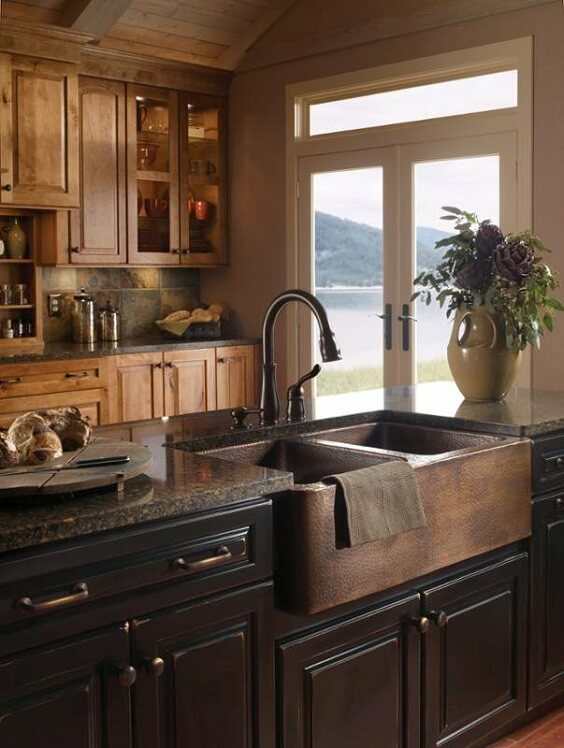 In this idea, a copper sink is chosen, complete with the farmhouse-style faucets which flow well with those rustic kitchen cabinets. As one of the essential features of a kitchen, the light fixture is something that you can’t miss to pay attention to in decorating the room. 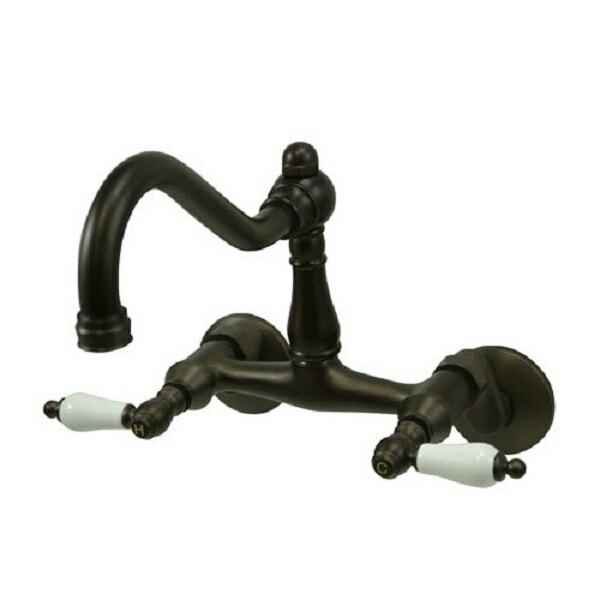 You can install some rustic or even industrial style light fixtures to complete the decor. This farmhouse kitchen ideas smartly use the lightest shade of gray for its cabinet which works as the major focal point of the room. Then, the wood flooring and white wall brighten up the room perfectly. 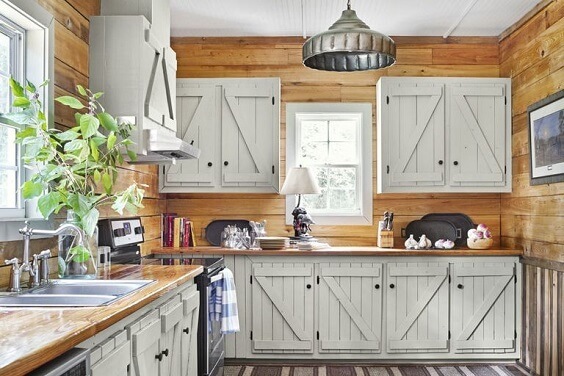 The rustic touch is one of the best options to complement a farmhouse kitchen, and this farmhouse kitchen ideas use the style perfectly. All of the walls in the walls of this room are made in the rustic brick look which gives another style to its layout. 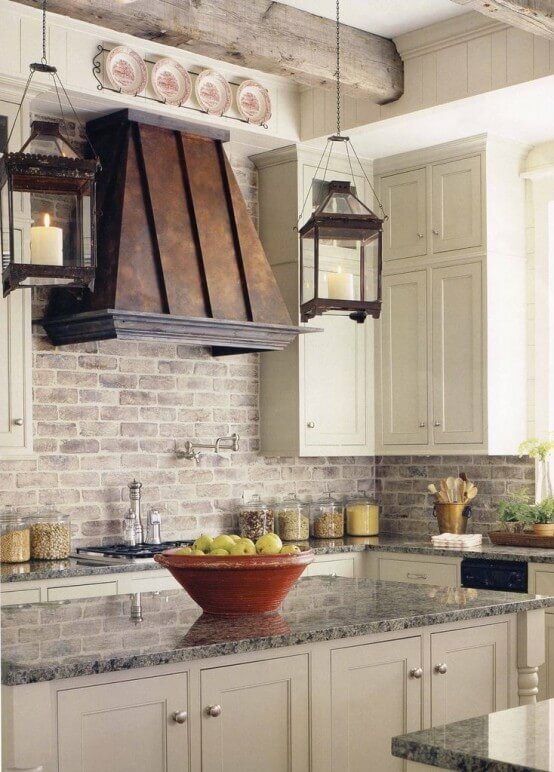 Then, a copper hood goes really well with the overall look of this kitchen. 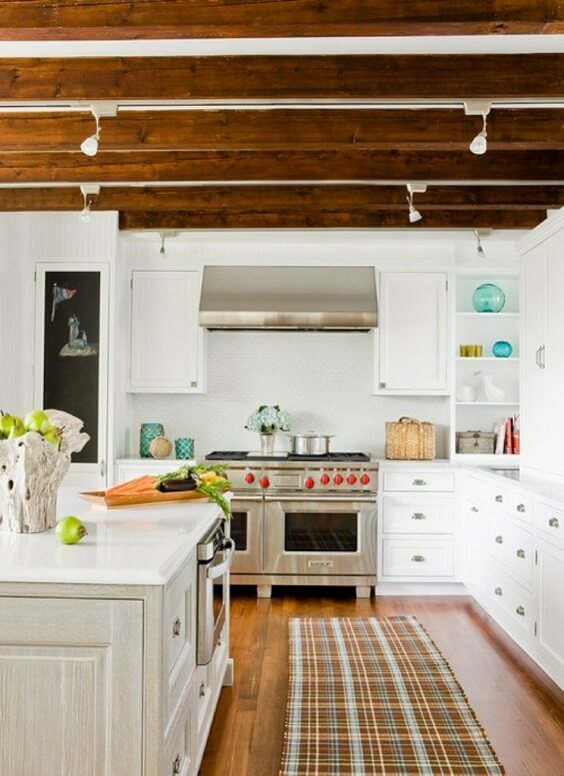 Exposing the wooden beams of your kitchen is surely a considerable idea to make a superb farmhouse kitchen. 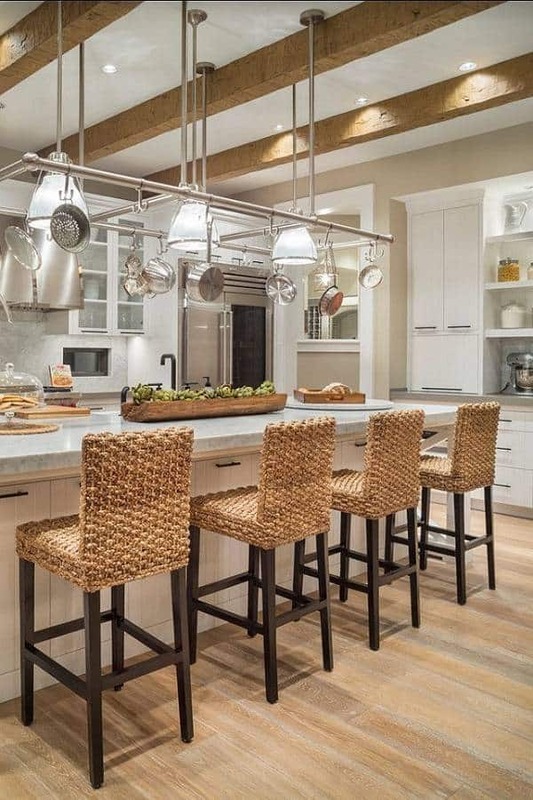 Here, wood dominates the layout of the kitchen including the rustic beams which totally makes it look so attractive. It’s always safe to say that an all-white layout is still the most popular choice up until today. In this farmhouse kitchen ideas, such look is beautifully combined with the wood flooring and exposed ceiling beams to give a more rustic and natural nuance. The decor items definitely play a huge role in influencing the overall look of a room, and in this farmhouse kitchen ideas, some decorating stuff are placed gorgeously. 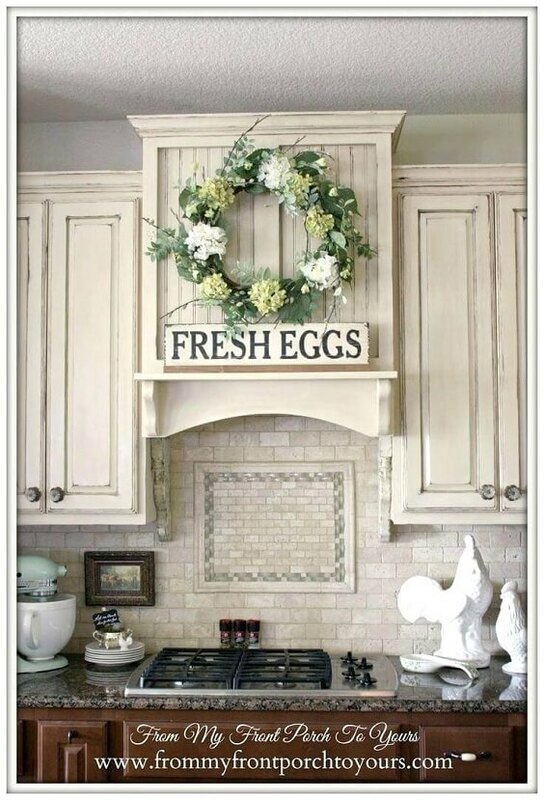 Those vintage wreaths, wall arts and the chicken figures on the countertop style up the room admirably. 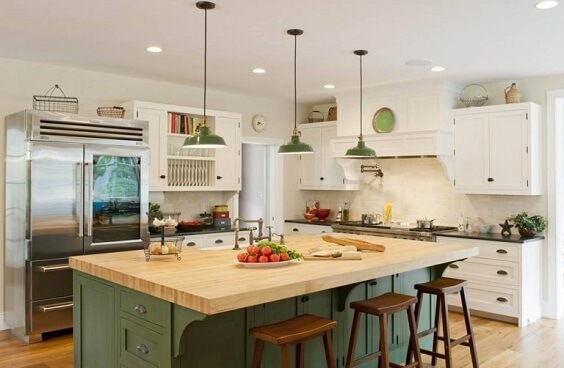 This farmhouse kitchen ideas is dominated by woods from ‘head to toe’, but they are finished with different colors. The white wooden cabinets, natural wooden wall, white wooden ceiling, and decorative wooden flooring create a nice decorative look which is so inspiring to try. One of the easiest ways to make a unique farmhouse kitchen is by finishing one o the wall in the room with the chalk paint. 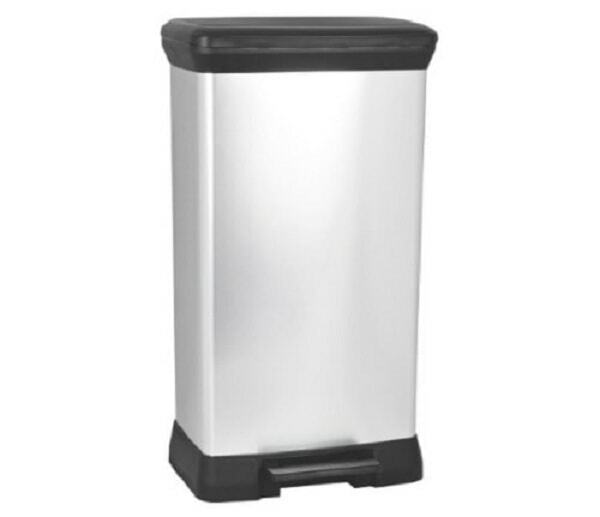 It gives a nice rustic touch which makes the kitchen look more exhilarating. 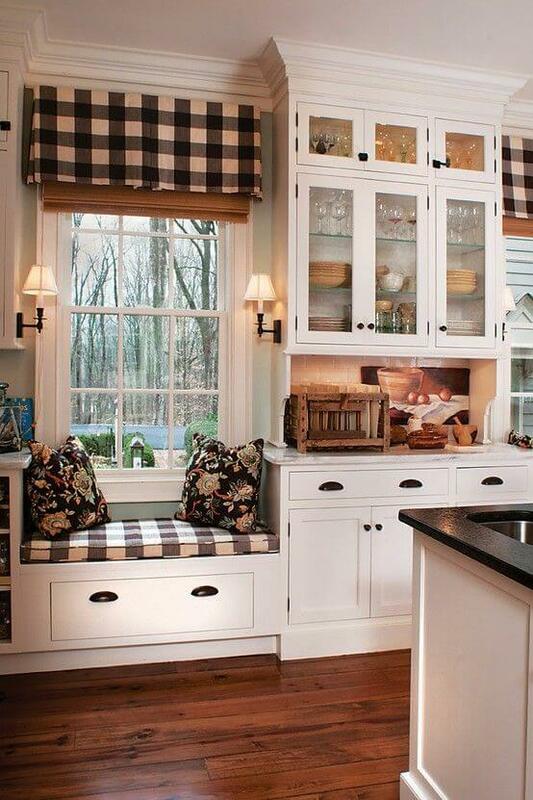 Building a sitting area is surely a great thought to make a joyful farmhouse kitchen, and here, a mini bench is installed in one of the windows area. It actually benefits the top of a cabinet by just simply placing a cushion and some throw pillows. 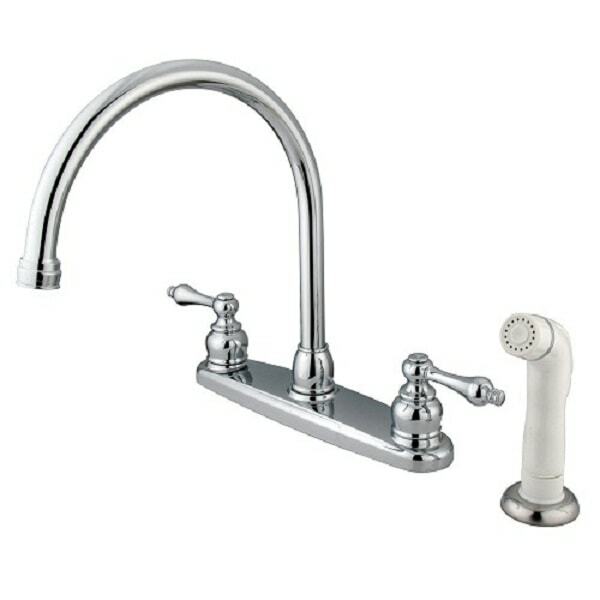 The sink is the essential feature of a kitchen and choosing the vintage one is surely a great option to decorate a farmhouse kitchen. 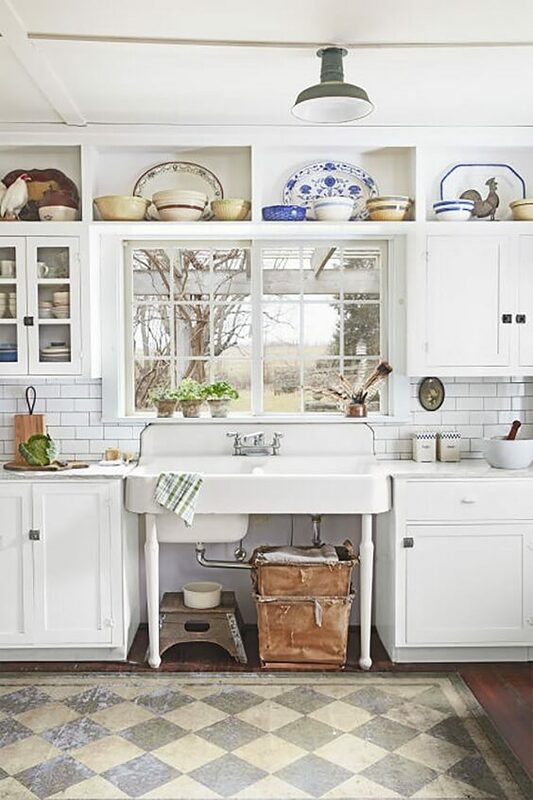 In this farmhouse kitchen ideas, the white vintage sink complements the classic cabinet and backsplash beautifully. 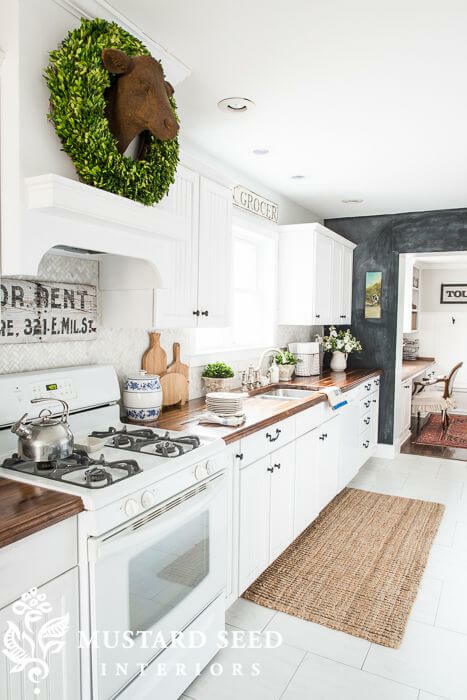 A nice decorative farmhouse kitchen ideas with a white overall look which is worth to be added to your inspiration list. 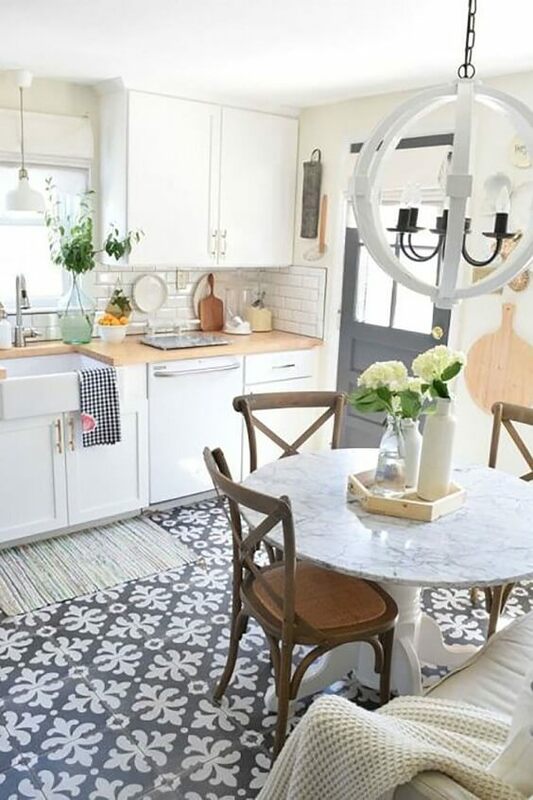 Though it applies white, its decorative tile and bold color touches make the kitchen look way more attractive. 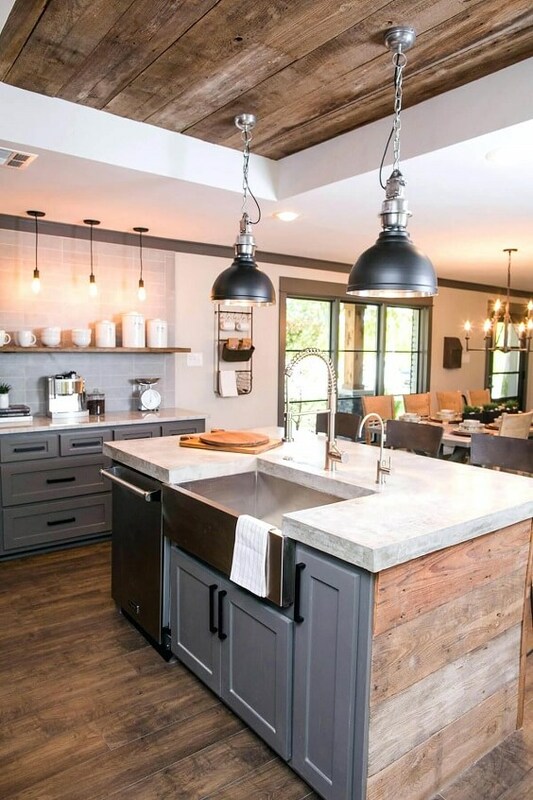 The washed wood finish is one of the best options to create a stylish rustic touch and use such look for a farmhouse kitchen is a clever option. Here, the finish is used in the kitchen island and backsplash, giving a chic nuance to its layout. If you check out the layout trend of this year, the decorative ceiling will be on the top list. 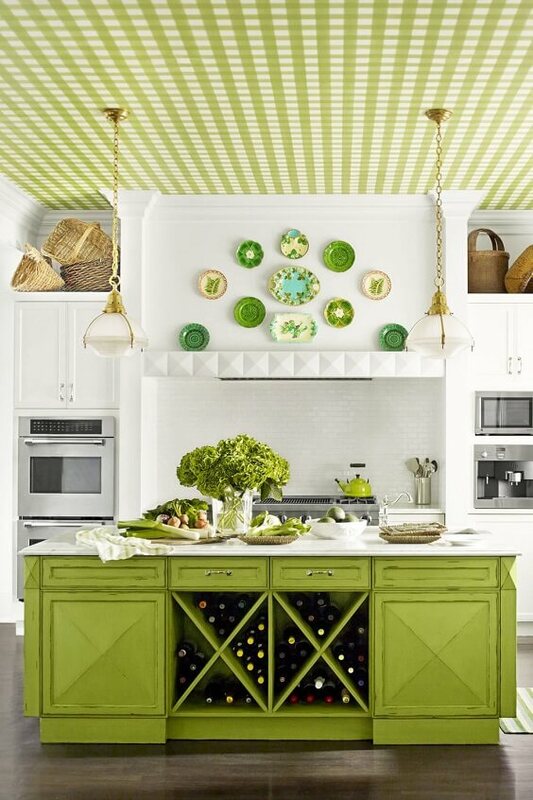 In this farmhouse kitchen ideas, the ceiling is finished in a green tartan pattern which complements the white wall and green kitchen island gorgeously. 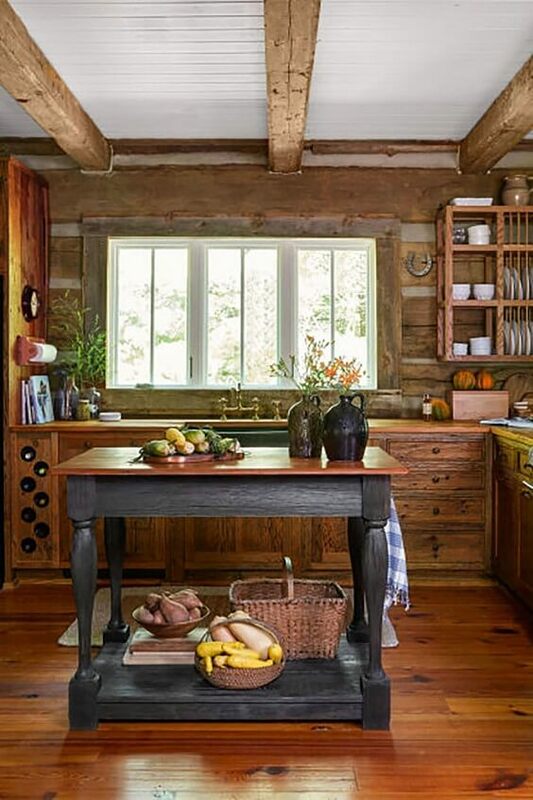 Giving a natural touch to a farmhouse kitchen is a must-try thing that you can do to make it look and feel inviting. 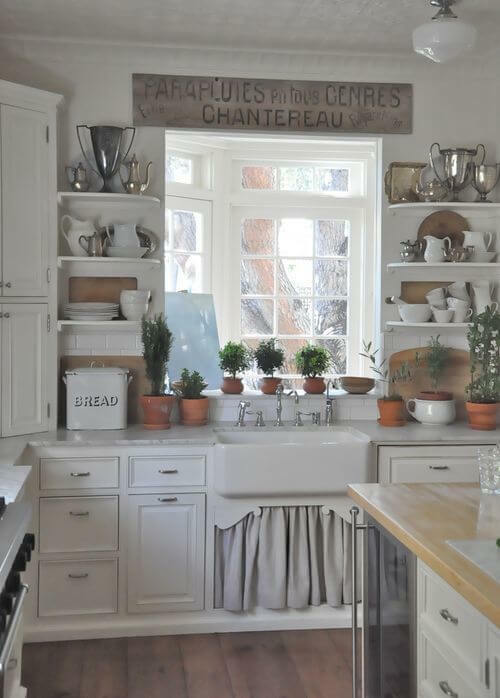 You can simply place some mini planters with cute greeneries on the countertop just like this farmhouse kitchen ideas shows. 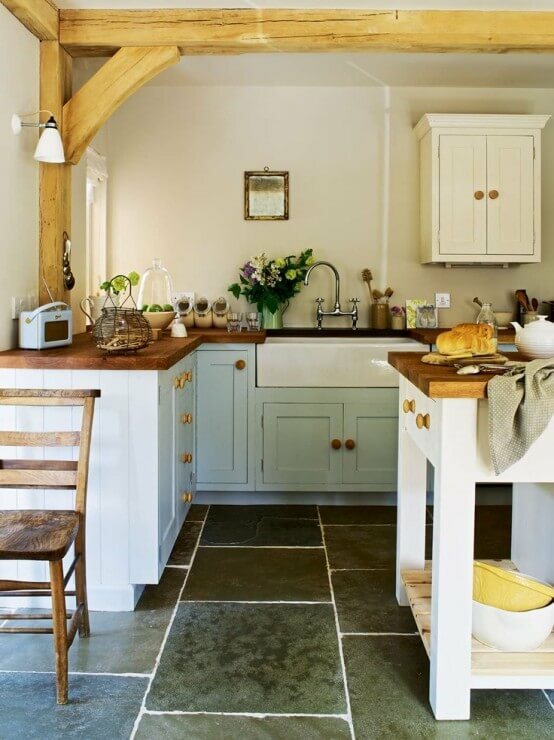 If you are looking for a farmhouse kitchen which looks more ‘plain’, this one can be one of the best inspirations. All of the elements of the room are finished in shades of brown which create a warm nuance stunningly. 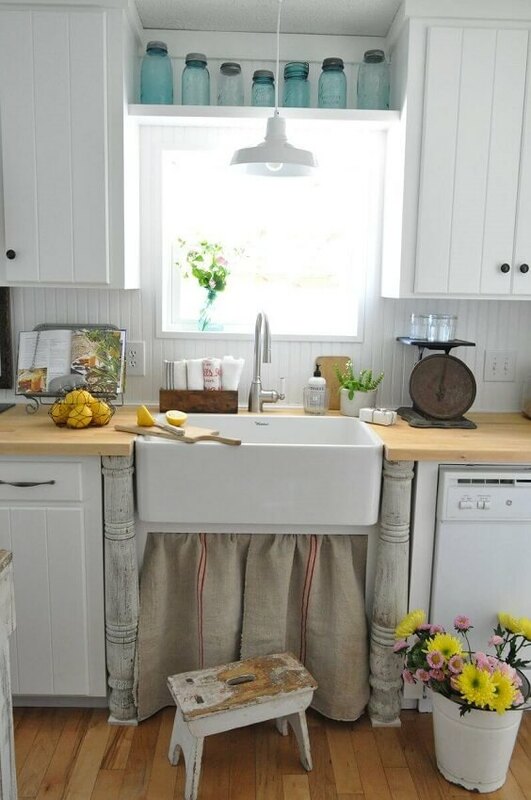 With its chic rustic look, the shabby chic furniture always works well for a farmhouse kitchen. 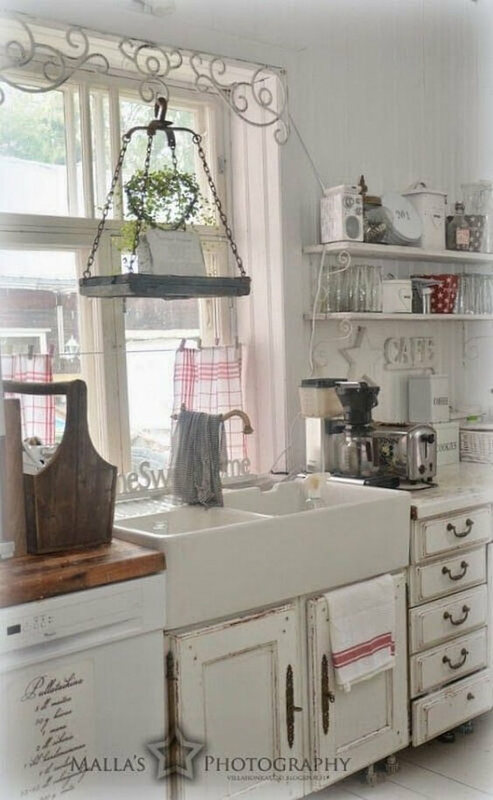 Here, the shabby chic cabinet in white distressed look is chosen to complement the rustic white layout stylishly. The slate flooring is a good alternative besides the wooden one, it will give a rustic and natural touch beautifully. 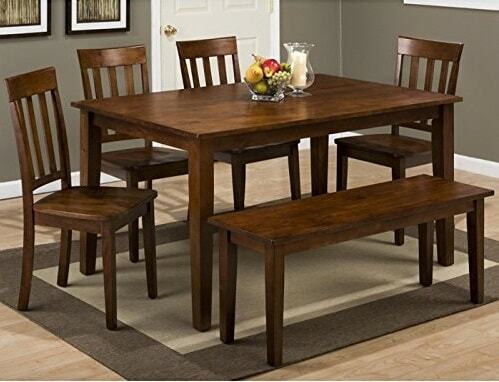 You can complement it with the wooden elements to create a beautifully earthy look. If decorating the ceiling doesn’t suit your taste, then you can choose to apply the decorative flooring. It’s a great choice to give a festive touch to an all-white layout or the one with neutral color. 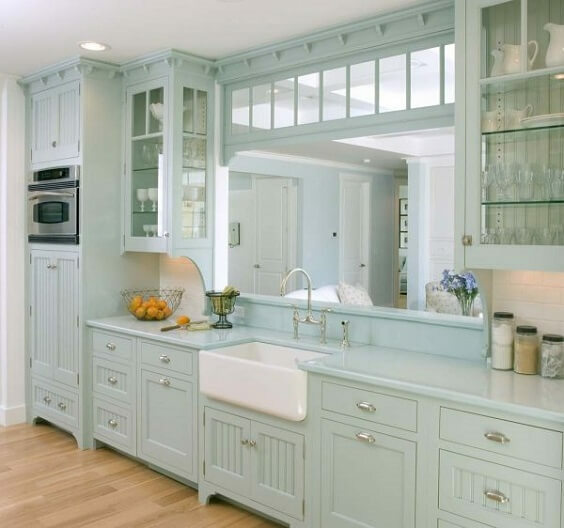 This farmhouse kitchen ideas beautifully blend some calming colors to create a very stylish layout. Matte green, natural wood, and white finish beautifully give the kitchen a stylishly natural nuance that makes it so tempting to copy. 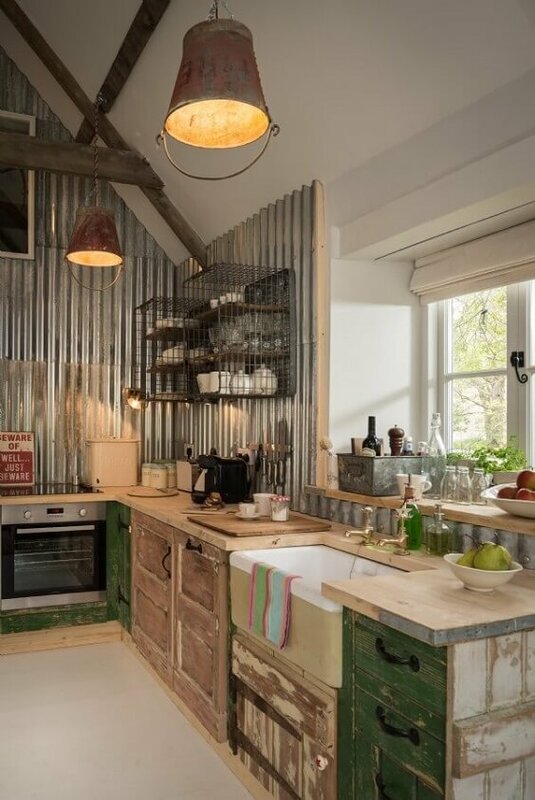 The corrugated metal sheet can surprisingly become a unique decor for a farmhouse kitchen which gives a traditional touch. 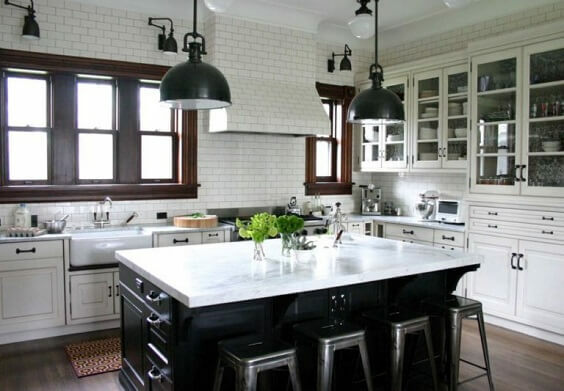 It’s definitely a good inspiration for you who want to have a distinctive farmhouse kitchen. 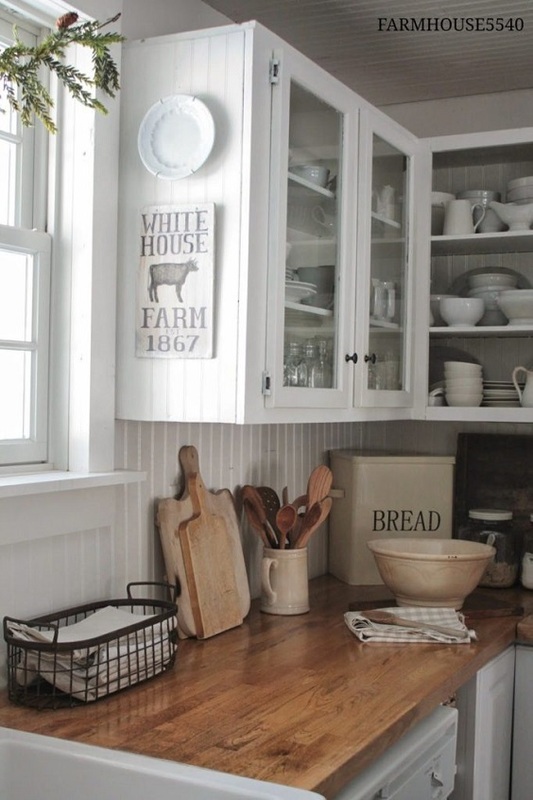 As has been told before that an open shelf can be a good element to complete a farmhouse kitchen, having a unique one sounds like a better idea. Here, the shelf is designed in a window look which adds another style to the kitchen’s layout. 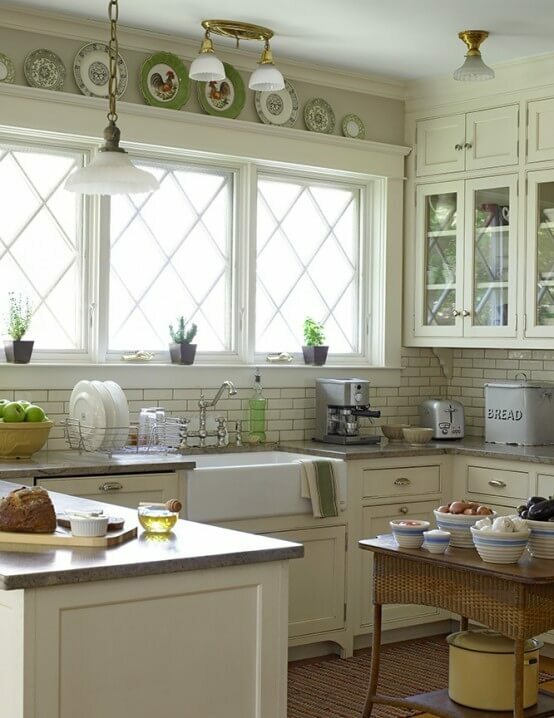 Instead of the plain glass window, choosing the decorative one is a more appropriate option for a farmhouse kitchen. You can have a nice festive decor once you install a decorative window. The wire basket is a nice additional storage for a farmhouse kitchen which also works to give the room a traditional rustic look. You can place some wire baskets on the countertop or inside the open shelves. The next stuff to decorate a farmhouse kitchen is the fabric which you can apply in the curtain or to cover the leg of your pedestal sink. Choosing the fabric with the rustic look (like burlap) is surely a better option to try. 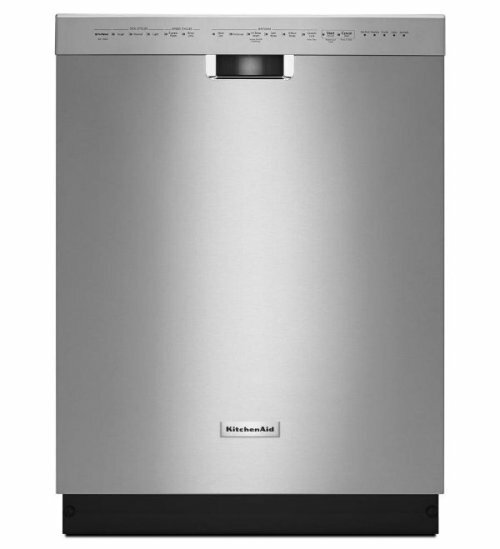 Instead of choosing the common range hood, you can choose the one which is designed with the scalloped accent. 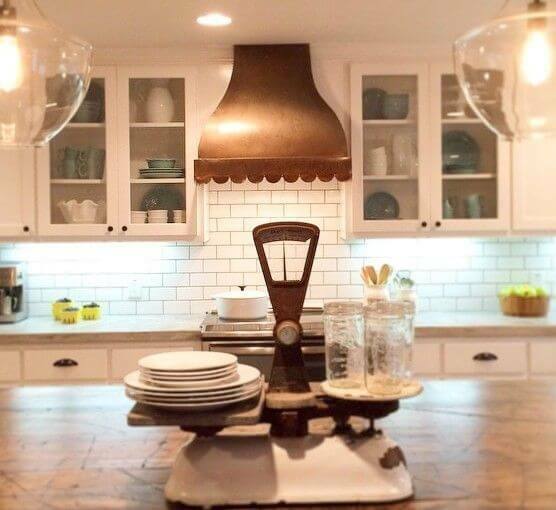 This kind of hood will make your farmhouse kitchen look way more stylish for sure. 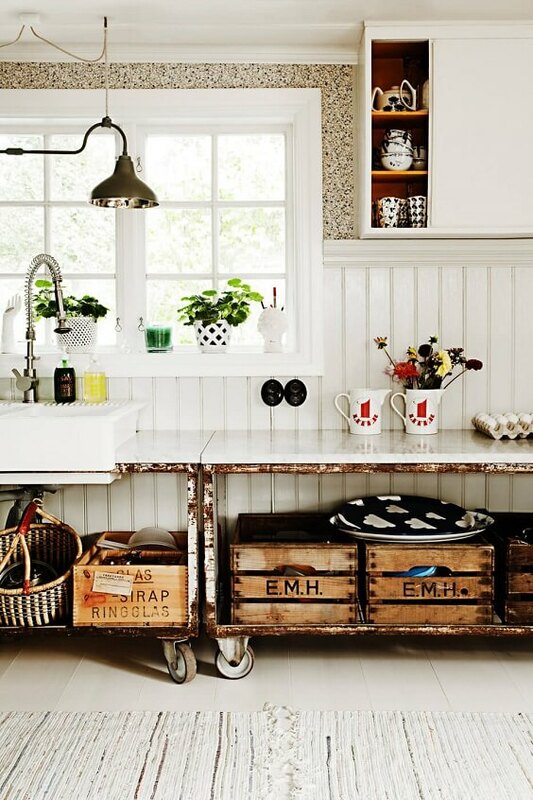 The shipping pallet or crate is a good additional storage for a farmhouse kitchen since it will give a nice rustic touch. It’s nice to place under the table or an open cabinet so you can use it conveniently. Tempting, right? 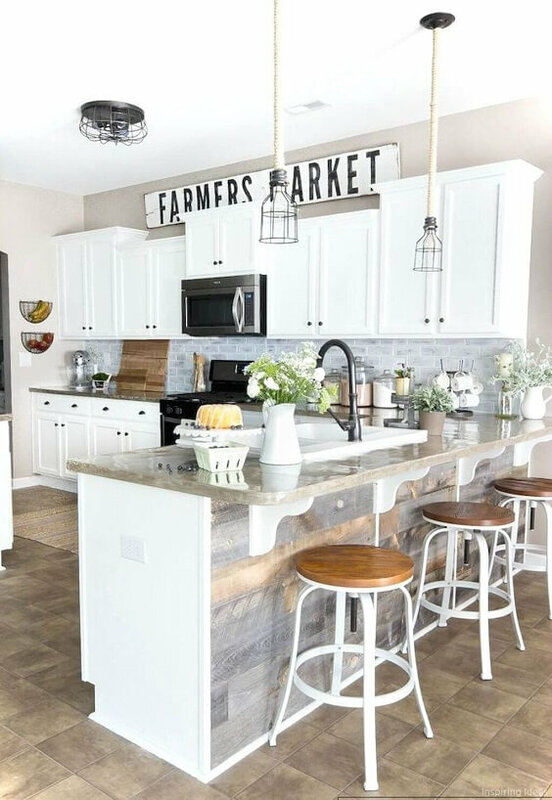 After scrolling around to those farmhouse kitchen ideas, you must be convinced to apply the style to your very own kitchen. 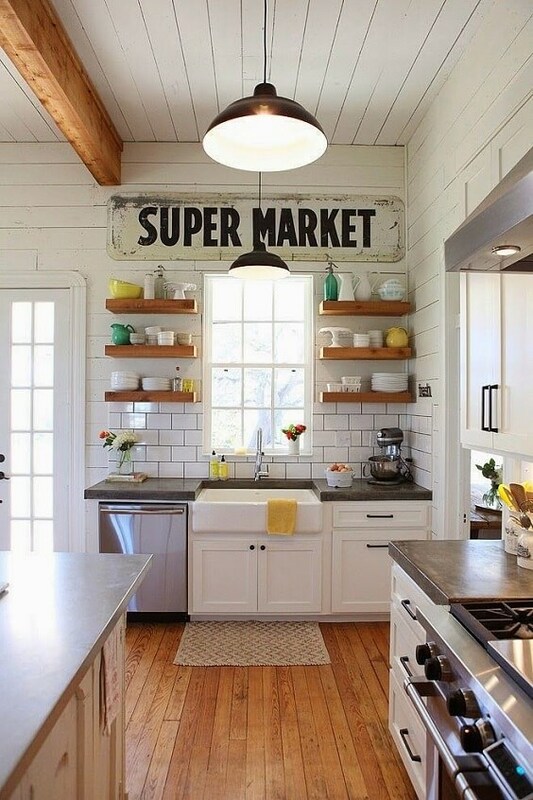 The farmhouse style always matches well with the kitchen atmosphere since it involves some natural material like wood. Those farmhouse kitchen ideas are so worth to be included in your inspiration list next time you want to change the decor of your kitchen. 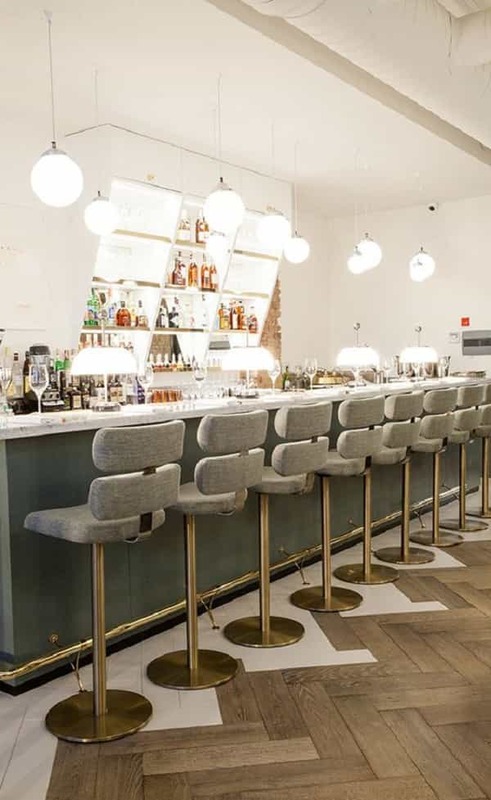 They will make the room as stylish as possible which is not only amazed everyone but give you an exhilarating atmosphere. 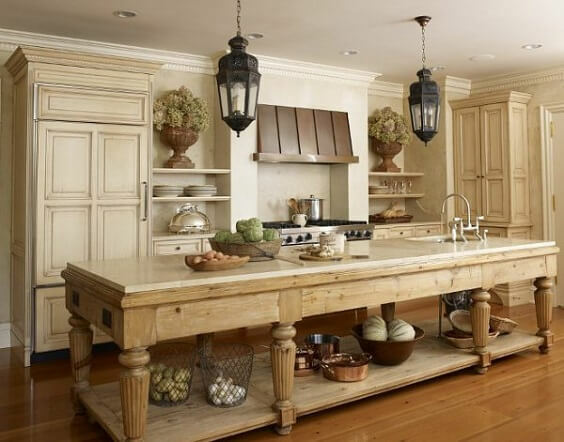 Rustic Furniture – The naturally finished cabinet, kitchen island, or stools are always the better option for a farmhouse kitchen over the ones with a colorful look. Natural Touch – It’s so recommended to bring in some greeneries to a farmhouse kitchen since it will make the room more natural. 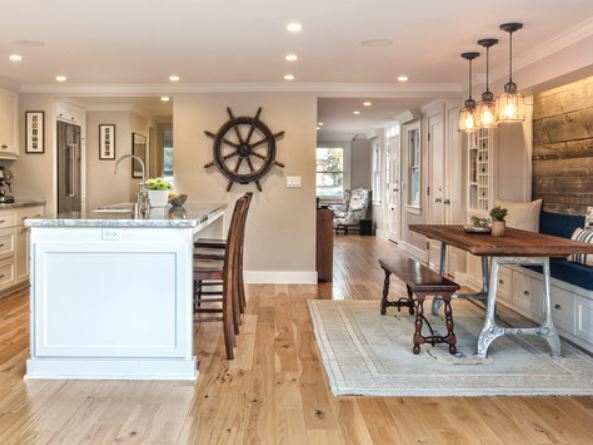 Decorative Element – Whether it’s the decorative flooring, ceiling, or rug, you have to add some festive nuance to make a stylishly attractive farmhouse kitchen. 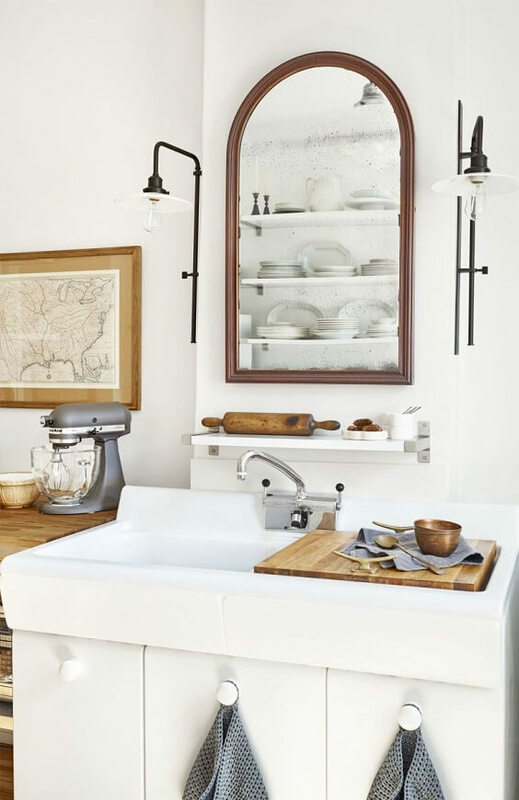 Vintage Appliances – Though combining a farmhouse layout with modern appliances is surely a thing, but choosing the vintage one is always considered to do. Decor Items – Hang a catchy wall art or place some cute statues will make your farmhouse kitchen look so exhilarating. Well, in conclusion, happy remodeling your very own beloved kitchen then!